ROME — The Italian language does not want for colorful insults. There are curses upon a person’s dead relatives, ample anatomical exclamations and countless ways to call someone a moron. But these days, it seems, one of the biggest put-downs of all is to call someone a do-gooder. Seventy migrants were rescued by the Italian coastguard on Thursday and brought to the island of Lampedusa, from which populist Interior Minister Matteo Salvini says they will be repatriated. “We are working to expel the 70 illegal migrants who have arrived at Lampedusa in the next few hours,” Mr Salvini said. Divisions on how to handle Russia’s “neo-imperial appetite”, among other factors, are set to block Italian far-right deputy prime minister Matteo Salvini’s ambitions to spearhead a new European Parliament league, Jan Zahradil, a leading Czech MEP and candidate for EU Commission president has said. 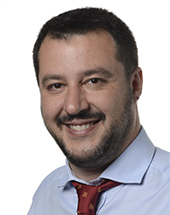 A new alliance of nationalist parties led by Italy’s Matteo Salvini has invited the Conservatives to join them in the event that Brexit is delayed and Britain has to contest the European Parliament elections next month. The alliance, unveiled in Milan on Monday, consists of Italy’s hard-Right League, the.